What is the difference between the Food Capsules and the Iodine+ Capsules? How do Seagreens® compare with other ‘superfood’ supplements? Are Seagreens® the same thing as ‘kelp’? Can I feed Seagreens® to my children? Can I use Seagreens® Food Capsules during pregnancy? 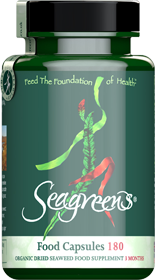 Is it true that Seagreens® can help regulate weight and reduce cellulite? B Vitamins - do Seagreens contain vitamin B12?